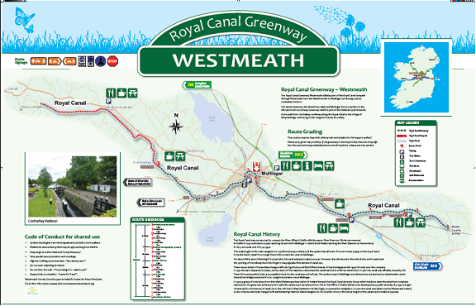 The Royal Canal Greenway Westmeath forms part of the off-road section of the National Cycle Network including a section of the Dublin - Galway Greenway utilising the RoyalCanal towpath. 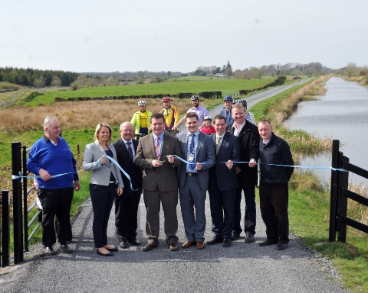 This project initially involved the provision of a shared pedestrian and cycle track along the Royal Canal towpath from Boardstown Bridge (east of the N52 crossing in Mullingar) to the Westmeath-Meath County Boundary. The track which is 18km in length was supported by the Department of Transport, Tourism and Sport under the National Cycle Network Funding Scheme. The works were fully completed in 2013. 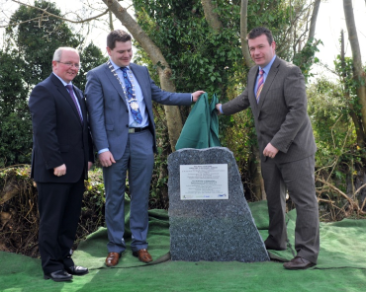 On the 15th April 2014 the Boardstown to the Meath County border cycle track was officially opened by Alan Kelly T.D. Minister of State at the Department of Transport, Tourism and Sport. The Greenway now measures 32km travelling through Westmeath countryside from the Meath Border to Mullingar continuing west to Coolnahay Harbour. The canal tow path from Coolnahay continuing along the Royal Canal to the village of Ballynacargy and to the Longford County Boundary is also being developed as shared pedestrian and cycle track further to funding packaged of €700,000 announced by the Minister for Transport, Tourism and Sport, Alan Kelly in May 2014. Works commenced in early January 2015 and are almost complete. The route is rated as Easy with a flat terrain and suitable for ‘infrequent cyclists’. Please note, given the proximity of the greenway to the Royal Canal, there are drop-offs into the canal and steep embankments at certain locations – please exercise caution. The Royal Canal was constructed to connect the River Liffey in Dublin with the upper River Shannon. Works commenced in Dublin in 1790 and lasted 27 year reaching its summit in Mullingar in 1806 before finally reaching the River Shannon at Tarmonbarry in 1817, at a total cost of £1,421,954. The total length of the main navigation is 145 kilometres (90 miles), and the system has 46 locks. There is one main water supply to the RoyalCanal is via feeder canal from Lough Owel which enters the canal at Mullingar. For about thirty years following its completion the canal enjoyed modest success. However, the railway era in the mid 1800′s, and in particular the opening of the railway line in Mullingar in 1849 signalled the demise of canal use. There was a revival of horse-drawn barge traffic during the Second World War because of fuel shortages and in 1944 CIE took over the company. In 1951 the last independent trader, James Leech of Thomastown, retired and the canal started to slide into dereliction. In 1961 the canal was officially closed by CIE. There followed a period when any possible future for the canal seemed unlikely. The section west of Mullingar was allowed dry out and serious deterioration set in. Several low bridges were built in Co. Longford and also one at Mullingar. In 1986 the canals were transferred from CIE to The Office of Public Works to be developed as a public amenity and in 2000 the canal was taken over by Waterways Ireland, a new cross-border body charged with administering Ireland's inland navigations On October 1st 2010 the whole length of the canal was formally re-opened. Cyclists should give clear hand signals and use bell to alert walkers. Walkers be aware that cyclists may be approaching from behind. Keep dogs on a short lead and ‘scoop-the-poop’. Take special care at junctions and crossings. Do not enter adjoining farmland. Respect the countryside – “Leave No Trace”. Westmeath County Council supports Ireland’s ‘Leave No Trace Principles’.